Lines Ballet in “Biophony,” whose dancers move to music of the natural world. “Biophony” may have entered into the lexicon of music, but not common usage. It describes the myriad sounds made by animals, from roaring lions to humming bees, to a sea anemone munching or a river otter pining for its lost mate. Introduced by musician, composer, ecologist and author Bernie Krause, he also coined anthrophony, defined as human noise, and geophony, non-animal sounds of nature. 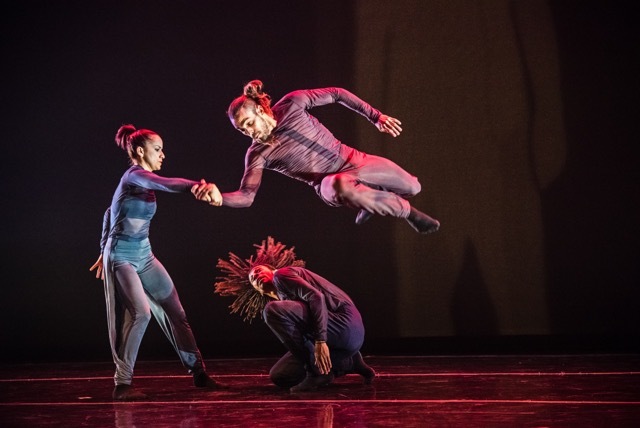 Over a lifetime, Krause collected the sounds of ecosystems from every continent and their oceans, and now the Alonzo King Lines Ballet will dance to those native rhythms. As part of the upcoming Laguna Dance Festival, the San Francisco-based company will perform “Biophony,” a collaborative work based on the nature soundscapes of Krause, symphonic music composed by British composer Richard Blackford and choreography by King on Saturday, Sept. 12, at the Laguna Playhouse. Adding to the excitement of the Sept. 3-13 festival is the West Coast premiere of the Malpaso Dance Company, which performs at the playhouse on Thursday and Friday, Sept. 10 and 11. The Havana-based company founded in 2012 by Dailedys Carrazana and Fernando Saéz has performed previously on the East Coast, said Festival executive director Joy Dittberner. “With both flags just having gone up again in Cuba and in the U.S., we are so excited. The timing could not have been better,” she said. “Soundscapes are divided into geophony, natural sounds of wild habitats, biophony, all organisms that exist in ecosystems, and anthropony, human sounds such as music and language, but also the noise that surrounds us daily,” explained Krause in “Finding the Origins of Music in the World’s Wild Places,” a book chronicling his research into the music of nature. Soundtracks by Krause, 75, figure in 135 feature films and sound backgrounds for aquariums, zoos and museums. The symphony made its debut at the 2014 Cheltenham Music Festival in England performed by the BBC National Orchestra of Wales. Shortly after his return to the U.S., Lines Ballet contacted Krause about collaborating on a ballet. “I spent time with Alonzo and found synergy between us. After hearing a large number of soundscapes, he selected sounds from Kenya, Borneo, Sumatra, the Amazon and Alaska and sounds from the ocean. There will also be a short segment based on killer bees,” he said, adding that some parts of the ballet will be danced without music. A few elements of the 54-minute composition have been scored to incorporate clarinet, flute, harp and percussion. Dittberner, the dance festival’s first appointed executive director, expressed excitement at the growth of this year’s dance festival, in its 11th season this year. “We are in a good place; we have proven ourselves to the community,” she said, citing the Malpaso’s premiere as a highlight, along with the Lines performance. Growth includes year-round master classes, two free performances this summer on the Festival of Arts’ grounds, a first-time salon with Hope Boykin of the Alvin Ailey Dance Theater and free performances during next week’s Artwalk on Thursday, Sept. 3, at the Laguna Art Museum and Salt Fine Art, 1492 S. Coast Highway. With growth come changes. Dancers will no longer stay as guests the home of board members, but be billeted at the Hotel Laguna, a festival sponsor. Krause called the Line performance of “Biophony” a major breakthrough in its presentation. “Alonzo works like a film director, demanding cutting edge work from dancers, designers and musicians. No one dances like this in the Western world, but the presentation will also reach out to kids and young viewers whose curiosity is still wide open,” he said. Lula Washington Dance Theatre, 6:45 p.m., Laguna Art Museum, 307 Cliff Dr.
Will Johnson and Celeste Lanuza Dance Theatre, 7:30 p.m., Salt Fine Art Gallery, 1492 S. Coast Hwy. Malpaso Dance Company, Thursday and Friday, Sept 10-11; 7:30 p.m., pre-performance talks, 6:30 p.m. $60. Students, $35. Alonzo King Lines Ballet: Saturday, Sept. 12, 7:30 p.m. $60 students $35. VIP artist reception 9 p.m. with Alonzo King and Malpaso performers, $125. Alonzo King Lines Ballet, Sunday, Sept. 13, 2 p.m. $60, $35. Pre-show talk with founder Jodie Gates and Alonzo King, 1 p.m. Body Traffic, Sept. 10, 4:30-6:30 p.m., Laguna Beach HS, 625 Park Ave. Dancer $25, observer $15. Age 12 up. Alonzo King Lines Ballet, Sept. 13, 10 a.m.-noon. Sold Out. Related story: The Southern California contemporary dance scene is being shaped by Laguna Dance Festival’s Jodie Gates. Due to erroneous information, the article “Laguna Fest Daces Across the Natural World,” the term for human noise was misstated. It should have read anthropophony.